ProudFolio is most definitely aimed at aspiring designers, developers, artists and photographers who’d like a framework theme which incorporates both a great-looking portfolio and a feature-rich blog. The best thing about this theme – is that you can manage your everything from one place! The template will automatically (visually) separate your blog & portfolio content, making this an amazing theme for aspiring designers, developers, artists, photographers etc. 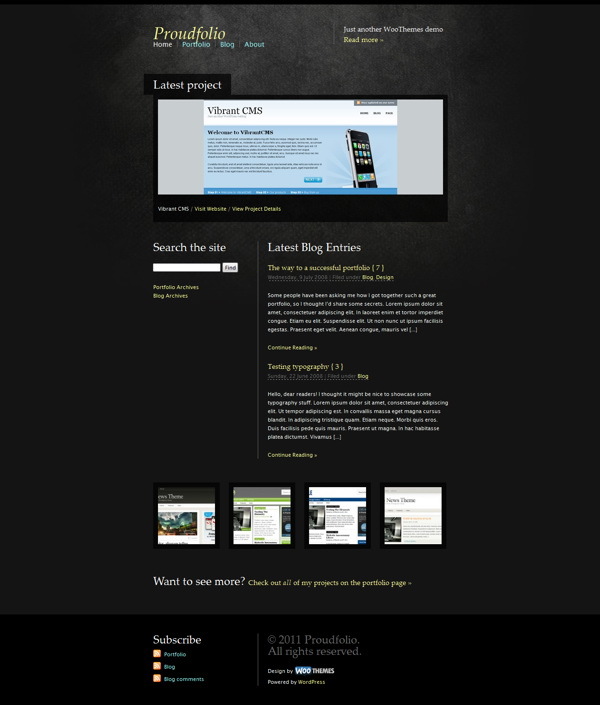 You get an unique homepage layout, which publishes only the most important information and unique page templates for the portfolio, blog, blog archives, tags & search results. It also comes with 3 beautiful alternate styles to choose from. Making simple changes without editing code, like adding your own logo, changing to an alternate color style, adding Google Analytics code, couldn’t be easier with the back-end theme options panel. The theme is compatible with all the modern web browsers like Firefox, Safari, Chrome and Internet Explorer. There is an image resizer script built into the theme framework to automatically scales your post images for pixel perfect display in our templates. No need to upload new cropped images when re-designing your website. It comes packaged with a .po file for easy WordPress theme translations into your desired language – editing one neat little file without hunting down text in the theme templates.